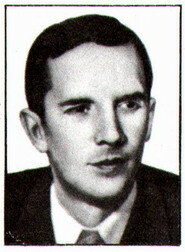 VORONIN, Viktor Nikolaevich (RU: Воронин, Виктор Николаевич) is the Soviet scientist in the field of the mining science, the doctor of the technical sciences (1947), and the professor (1951). After the graduation from the Moscow Mining Institute during the 1936, Voronin worked at the same place, and during the 1940-56, he was the administrator of the laboratory for the mining aerology at the Institute of the Mining Craft named after A. A. Skochinskiy. Voronin has identified the laws for the movement of the aerial streams and admixtures within the underground mine workings (of the drift-shaped, chamber-shaped, and longwall-shaped types), has researched the dynamics of the dusty and gassed aerial streams within the underground mines, has established the foundations for the mining gas dynamics, has created the theoretical foundations for the calculation of the airing within the mine workings.